I’ve been a sorry blogger lately, I must confess. I haven’t answered your kind comments on my posts or visited your blogs to write my own comments, although I have been reading everyone’s posts regularly. It’s just one of those times when my desire to read or my computer fatigue or both win out over my desire to blog. You probably know how that goes. Bill Bryson’s At Home: A Short History of Private Life. I’ve read rave reviews of this book, and I find the topic fascinating. At $5 for the hardcover, I couldn’t resist. Alfred Kazin’s A Walker in the City. I have a small but growing collection of books about walking, of which this is an important addition. Rebecca Solnit’s A Book of Migrations. I love Solnit’s book Wanderlust and recommend it to everyone who might possibly be interested. A Book of Migrations is about Solnit’s travels in Ireland. John Berger’s To the Wedding. I know absolutely nothing about this book, but John Berger is intriguing. John Berger’s Ways of Seeing. Art theory — who can resist? Jenny Erpenbeck’s Visitation. Another book and author I know nothing about, but I have vague memories of reading interesting things about her, so I went with it. Laura Kipnis’s Against Love: A Polemic. I’m intrigued by Kipnis and by the title of this book. I’m hoping to find some lively, controversial writing here. Mikhail Bulgakov’s Master and Margarita. I have heard about this book so many times on various blogs and in reviews, but I still couldn’t tell you what it’s about. I have a feeling it’s one of those hard-to-sum-up books. The Best American Essays 2011. I just started reading the 2010 edition of this series so I’ll be ready for the 2011 one soon. This series has introduced me to some awesomely great writers, and I’m unfailingly loyal to it. Frances Sheridan’s Memoirs of Miss Sidney Budolph. For when I’m in the mood for some eighteenth-century fiction. Laurie R. King’s The Moor. I found a trade-sized edition of this in very nice condition and couldn’t resist even though I have another book in the Russell series to read first. Nicholson Baker’s The Everlasting Story of Nory. I just heard an interview with Baker on Radio Open Source today, and it was great. Baker is my hero. So those are my dozen books. I spent an entire two days in Manhattan this weekend but I didn’t step a foot into a bookstore, which is very unusual. But it was because my sister and her husband were in town, and they had other things on their agenda. Hanging out with my sister in the city was fabulous — it involved music, art, tall buildings, people-watching, Central Park, and Indian food — and I hope we can do it again sometime soon. Full disclosure: a former professor of mine wrote this book, and it was a professor I liked very much, so I suppose I’m biased. But I’m quite sure I would have liked this book anyway, and I did like it very much. My guess is that book bloggers who like books about books and reading will enjoy it as well, since it touches on a lot of topics that get debated on blogs: how to choose what to read next, how best to do that reading, “serious” reading vs. reading purely for pleasure, the value (or lack thereof) of keeping lists and making reading plans, the danger of technology pulling us away from our reading. This book is also great for anyone who feels uncertain about their reading choices and abilities. I want to recommend it to all the people I can think of (and it’s a lot of people, including many students, and including, sometimes, myself) who have ever expressed a doubt about their status as a reader. My guess is that it will make them feel much better. What I liked best about this book is how successfully it makes recommendations and gives advice without coming across as preachy or judgmental. Jacobs has very definite opinions on things, but I got the feeling that he would not mind a little disagreement. His main argument is that you should read at whim and that pleasure in reading should be your first goal. He also believes that you should mark up the book as you read — or at least you should if it’s something more complex than a thriller that’s not meant to be analyzed that closely. You shouldn’t worry about reading a lot of books; in fact, he believes you’re probably reading too fast and should slow down. He strongly dislikes books such as How to Read a Book, and 1001 Books You Must Read Before You Die because they encourage the mindset of reading only in order to cross something off a list. Rereading is very much a good thing. But the tone that comes across is warm and generous, not scolding. (In fact, while I was in the middle of reading the book, I tweeted something about being absorbed in it but allowing myself a Twitter distraction now and then, making a little joke about his title, and he tweeted back, “It’s allowed!”) Mostly, he just wants people to enjoy their reading and to read exactly what they want to, because that’s the practice that will make reading meaningful and take the reader in unknown and exciting directions. To complicate the reading for pleasure idea, he talks about whim vs. Whim. Lowercase whim is “thoughtless, directionless preference that almost invariably leads to boredom or frustration or both.” Uppercase Whim, however, “can guide us because it is based in self-knowledge.” We learn, over time and by paying attention to our own responses and feelings, what it is we really want from books. We figure out when we want something challenging and difficult and when we want to reread an old favorite or to pick up a book we won’t have to think about too much. We figure out when to put down a book that isn’t working for us or to keep at it because we might come to like it later, or even because we think we might want to reread it in ten years and appreciate it only then. Reading for pleasure is not a simple thing — pleasure itself is not a simple thing. Fortuity happens, but serendipity can be cultivated. You can grow in serendipity. You can even become a disciple of serendipity. In the literature of the Middle Ages, we see reverence for the goddess Fortuna — fortune, chance — and to worship her is a religious way of shrugging: an admission of helplessness, an acknowledgment of all that lies beyond our powers of control. But in the very idea of serendipity is a kind of hope, even an expectation, that we can turn the accidents of fortune to good account, and make of them some knowledge that would have been inaccessible to us if we had done no more than find what we were looking for. Indeed, it may be possible not only to cultivate the sagacity but also the accidents. It may be possible, and desirable, to actively put yourself in the way of events beyond your control. This is a philosophy of life as much as it is of reading, and I like it very much on both accounts. It can be wonderful when reading — or life — takes you in unexpected directions (it’s much less risky when it’s reading we’re talking about, though), and it seems worthwhile to strive to be the kind of person who can take full advantage of, and indeed to seek out, the accidental. 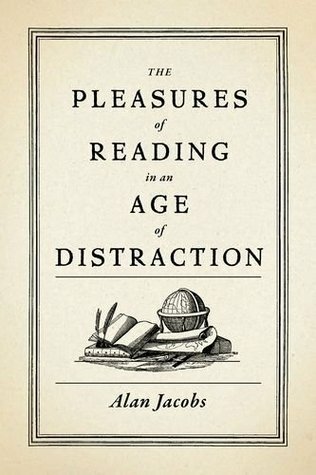 Jacobs says his book is aimed toward people who find themselves struggling to read because of the lure of technology and their inability to concentrate after too much time spent multitasking, skimming websites, and following links. He does have a lot to say about this problem, but his potential audience is actually much wider: it’s anybody who likes to think about reading. It’s a book that will inspire you, I think, and inspire you not to read like Jacobs does, necessarily, but to figure out how to read like yourself.